The Lehigh Valley IronPigs have announced special Ladies Night Packages for a trio of 2019 home dates - June 6, July 24 and Aug. 19. On Thursday, June 6, the Pigs will host a pre-game sangria tasting featuring four samples of sangria from Sleepy Cat Urban Winery. Each package includes a ticket to the game vs. Pawtucket (7:05 p.m. first pitch), access to the one-hour sangria tasting (5-6 p.m.) and a silicone wine glass. Each June 6 package costs just $35. Click here to purchase. At 5:45 p.m. on Wednesday, July 24, the Pigs will host a 30-minute pig yoga session on the field (weather permitting). For $45, guests will gain access to the pig yoga session (with real pigs on the field! ), a ticket for the Pigs' 7:05 p.m. contest vs. Toledo and a drink ticket for a glass of Sleepy Cat wine or a Coca-Cola beverage. For each purchase, the IronPigs will donate $10 to Fairy Tale Acres Farms, which rescues pigs from unfair living conditions and provides them with a happy home. Click here to purchase. 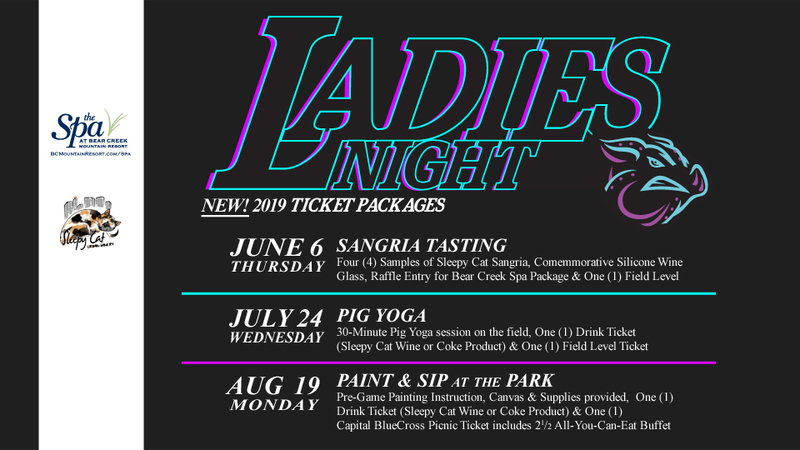 The final Ladies Night of 2019 will be Monday, Aug. 19 and feature Paint & Sip at the Park. This pregame session will include a small canvas and supplies, painting instruction, a drink ticket (for a glass of Sleepy Cat wine) and an Capital BlueCross Oasis game ticket, which includes a 2 1/2 hour all-you-can-eat buffet, unlimited soft drinks and great views from down the left field line. This package is available for $50. Click here to purchase. "This season, we wanted to give more personality to our Ladies Nights and create more memorable experiences for our guests," said Lindsey Knupp, Vice President of Marketing & Entertainment for the IronPigs. "We've got three very different experiences lined up for 2019 and are sure people are really going to enjoy what we have in store." A special offer featuring all three tickets and experiences is now available for $110 - a $20 savings off the individual prices. Contact the Coca-Cola Park ticket office at (610) 841-PIGS (7447) for details, or to secure your spot today. These Ladies Night special offers are the latest in a series of exciting ticket offerings from the Lehigh Valley IronPigs. Bacon, USA ticket plans ranging from four-game to full-season packages are currently available at PigsMemberships.com. The Pigs have also released a number of Themed Ticket options including Nickelodeon Day featuring Paw Patrol and Christmas in July at IronPigsBaseball.com/ThemeNights. Individual tickets for all IronPigs home games will be available Saturday, March 2 during the team's annual "Pig Day" celebration.